Kyūzō stood motionless, vacillating, when again he heard the sound of approaching footsteps. They stopped directly in front of him. Best known for The Woman in The Dunes, Abe Kōbō is widely recognized as one of the most important Japanese writers of the 20th century. 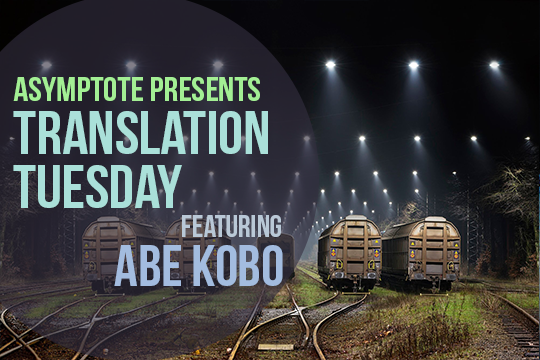 Today, we’re thrilled to partner with Columbia University Press to present an extract from a new and forthcoming Abe novel in English translation. Beasts Head for Home takes place shortly after World War II, when Japan was forced to give up its extensive colonial holdings throughout Asia, and Japanese civilians residing overseas began to return en masse to Japan. In the following excerpt, Kuki Kyūzō, a Japanese youth abandoned in what was previously the Japanese puppet state of Manchukuo (in Northeast China) stows away in a train in order to return to a homeland he has never seen. As the wind died, the fog began to rise. On the railroad tracks, the blurred shadows of the patrolling soldiers turned back in the opposite direction. As soon as they disappeared, Kyūzō crawled out from the hollow space of the warehouse, cut across the tracks, and slid down the far side of the embankment. Here there were fields as far as the eye could see. On his right one kilometer away there appeared an iron bridge, directly in front of which the railway siding split o from the main line. Kyūzō soon detected the heavy echo of iron striking together. He then heard the jumbled sounds of footsteps and people speaking. One of the men standing there was a soldier, while the other seemed to be some type of maintenance worker. Suddenly a red light appeared in the cab of the train. It’s about to depart, Kyūzō thought, and he hurriedly slid down the embankment and ran toward the back of the vehicle. The train was surprisingly compact. There were two open freight cars, three large boxcars, two small boxcars, an additional three open freight cars, and finally two linked passenger cars in the rear. The passenger cars were of course out of the question, and the open freight cars would also prove difficult. He would thus need to choose from among the five boxcars in the middle. The small ones, with their many gaps and open glassless windows, seemed to be used for livestock transport. Yet they contained burlap sacks rather than livestock. The windowed cars would be more convenient in various ways, but the larger boxcars appeared best on account of the blowing wind.